If you have even the slightest interest in urban agriculture, the following event is for you! Will Allen is a leading figure in the ever growing urban agriculture movement. Come hear him speak. Get your tickets now. 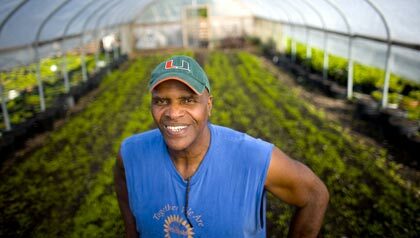 Will Allen, son of a sharecropper, former professional basketball player, ex-corporate sales leader, and longtime farmer, has become recognized as among the preeminent thinkers of our time on agriculture and food policy. The founder and CEO of Growing Power Inc., a farm and community food center in Milwaukee, Wisconsin, Allen is widely considered the leading authority in the expanding field of urban agriculture. At Growing Power and in community food projects across the nation and around the world, Allen promotes the belief that all people, regardless of their economic circumstances, should have access to fresh, safe, affordable and nutritious foods at all times. Using methods he has developed over a lifetime, Allen trains community members to become community farmers, assuring them a secure source of good food without regard to political or economic forces. In 2008 Mr. Allen received the prestigious MacArthur “Genius grant” for his efforts to promote urban sustainable food systems. Later, in 2010 Mr. Allen joined First Lady Michelle Obama as she launched the White House’s “Let’s Move” campaign to address issues affecting American youth and the risk of obesity and later that year was also recognized as one of TIME magazine’s 100 Most Influential People in the World. Since then, Mr. Allen has received numerous awards and recognitions, including the James Beard Foundation Leadership Award in 2011 and the NCAA Theodore Roosevelt Award in 2012, which is the highest award the National Collegiate Athletic Association can bestow on a former collegiate athlete. Hosted by: Santropol Roulant, Concordia City Farm, Mcgill Office of Sustainability, CRAPAUD, and the People’s Potato.